From 500.000 to c. 6.000 BC the Egyptian soil was inhabited by palaeolithic peoples who hunted in the green plains of the Sahara, which was not a desert yet. These were nomads who followed the big game movements over the savanas and gathered the products of the earth, had only a minor impact on the territories they frequented, very abundant in savage fauna and in edible plants. They lived in very small pluri-familiar settlements of few scores of individuals with equal social status (bands or little tribes). All through the millennia their technical skills in producing useful stone tools got better and better : from the raw and big 'hand axes' to the smaller choppers and flint splinters their remains show a clear evolution in shaping more efficacious instruments. But this was a very slow progress in comparison with the later (and modern) evolution. About 6000 BC the Neolithic began in Egypt : the stone objects became handsomely manufactured 'microliths', the social groups grew in number (agglomerates of hundreds of individuals) and the first true villages were built. The most important innovation of this period is the agriculture, which produced a chain of correlated major transformations in the neolithic societies: the possibility for the men to manage their spare time did open the way to the craftsmanship; the need for more hands to work in the fields or to breed the domestic animals made the population grow rapidly; the advance in the farming and breeding in turn made it possible to feed larger groups of population. Storage (in mat-lining silos-pits) and surplus facilitated the survival also in adverse climate seasons; animals often were used for other purposes than meat-production: milk, fur, bones and horns were used as well. In terms of social complexity this period is still very similar to the palaeolithic but some individuals as charism-chiefs or shamans could have begun to emerge as authoritary leaders of the groups. The burials anyhow show no social difference and the population is still in a tribal-like stadium. The impact on the territory begins to be more accentuate, because of the increase in population that requires more food, wood to burn, animals to kill and implies the possibility of a better and more efficacious organization for undertaking wider projects of architecture (like megaliths or dykes); the environment begins to be more heavily modified for the urges of those who live in it: a higher level of technical skills is shown by the artefacts dated to that period; but also the 'thought' has become more complex and the objects connected to the religious sphere are a clear proof of this fact. During the Fifth Millennium BC Egyptian Neolithic societies were stepping towards the so called early predynastic phase, a transformation which will be accomplished at the end of that millennium by different cultures from the Delta to the Upper Nubia; these peoples were the result of a cultural/ racial crossover which had occurred at intervals all along the previous centuries and millennia, when the local inhabitants of the Nile valley had merged with others entering the valley from the West (especially at southern latitudes) and from the East (in Delta and Fayum). The migrations from Eastern Sahara and Western (Egyptian) Oases were caused by the slow but progressive climatic modifications which were drying up rivers and lakes of what we know to have been a huge and hospital savannah, transforming it into something very similar to the uninhabitable desert of today (palaeoclimatology has shown that the last wet phase -the Neolithic Subpluvial "climatic optimum"- occurred in the Sahara from c. 8.000 to 5500 (or 3000) BC, the worsening began around 3000BC and the very arid desert environment of today only 2000-3000 years ago). Similar climatic changes and related population movements had already happened in later Middle-Palaeolithic when the Desert had been abandoned only to be re-occupied in early Holocene. A rich patrimony of rock graffiti and paintings preserved in the regions of Tassili-n-Ajjer, Tadrart Acacus, Hoggar, Air, Tibesti, Ennedi and Gebel Uweinat constitutes a boundless encyclopaedia of the life in Central and Western Sahara before these regions were abandoned by most of the animals which those graffiti represent and by the humans who had drawn them. The study of these cultures has evidenced interesting parallels between the Saharian and Nile Valley dwellers; probably the local gatherer/fishers inhabitants of the Valley mixed up with groups of cattle herding peoples from the Sahara (and with caprovine herding groups from the Levant), but it is still difficult to isolate the influx of the agro-pastoral incomers onto the Nile Valley 'indigenous' societies and to define the chronology of these events; worthy of a mention are the similarities in the art of the two macro-groups; the discovery, in 1959, of a child buried with traces of intentional mummification in the Tadrart Acacus, Western Libya, dated 5405 � 180 BP; furthermore there are several indications of contacts between Eastern Sahara, Western Egyptian Oases and the Nile Valley, Delta and Fayum: Red Sea shells found in Sahara sites; common use of ostrich feathers and egg-shells; similar concave-base bifacial arrowheads; Sudanese ceramic traditions bearing clear analogies with the impressed wavy line Saharian pottery (impressed zig-zag decoration is also reported from lower layers of Delta sites like Tell el-Iswid, Tell el-Farkha, Tell Ibrahim Awad and Tell Fara'in-Buto, but nowhere in the Nile Valley north of Khartoum). Therefore, as it already happened during older dry phases, the whole Nile Valley was an obvious, natural pole of attraction in the migrations of Sahara (and Near Eastern, cf. below) inhabitants. We can divide the Egyptian Neolithic in Early Neolithic (circa 9000-6800 BC, mainly from Nabta Playa) and two more recent phases: Middle (6500-5100) and Late Neolithic (5100-4700 BC). The term Neolithic is used here in respect of the lithic and ceramic technologies and animal breeding: the first attestation of agriculture in Egypt is known only with the Fayum culture (c.5500-4500BC), perhaps introduced from the Near East (where it's more than a millennium earlier). The Fayum was settled since Lower Palaeolithic, but only about 7400 or 7000 BC (Qarunian) the fisher-gatherers were replaced by (or became ?) a Neolithic culture; the Fayum A Neolithic sites are characterized by the presence of many silos (circular holes dug in the ground and lined with mats, for storing the cereals yield, e.g. wheat and barley), thousands of hearths, large amounts of tools, pottery and animal bones fragments, but only few traces of huts. Animal husbandry (cattle, goats/sheep, pigs) is well attested but plants gathering and especially fishing and hunting were still very important means of subsistence in the village life of the Fayum A groups; the lithic technology (espec. arrow-heads) is undoubtedly related to that of the Western Desert Late Neolithic. Another important Lower Egyptian Neolithic culture flourished at Merimde Benisalame, NW of Cairo (4900-4400 or 5000-4100 BC). As the Fayum A, these peoples practised breeding and agriculture (using mat-lined and big-pottery underground-silos), but they also exploited the savannah and marshes game: antelopes, gazelles, birds, turtles, fishes, hippopotami. Very interesting are the earliest traces of the presence of grave goods in some burials, marking the beginning of a certain degree of social stratification (which has no parallel among the Fayum sites). In the later phases the inhabited centre had become a true village with permanent houses partly dug in the ground; a debated aspect of Merimde is that of the burials under the houses: this could be, for most of the known cases, due to the fact that the houses had been built on tombs of earlier periods (or viceversa); however there doesn't seem to have existed any defined separation between the houses of the living and those of the dead at Merimde. Some types of pottery vessels and anthropomorphic figurines, pear-shaped mace-heads, few palettes and stone vessels are both evidence of crafts specialization and a possible trait d'union with the Maadi, Badarian and Naqada I-II cultural complex. Various elements of Near Eastern provenance (arrowheads types, pear-shaped maceheads, footed pottery, emmer wheat, sheep and goats) have been detected both in Merimde and Fayum cultures. On the other hand there seems to be a prevailing African-substratum current in the southern areas like Oases, Nabta Playa (Cattle cult, megalithic alignments; the Playas' Neolithic, which we cannot discuss here, had a prominent role in the series of relations between Western Desert and Nile Valley), Upper Nile Valley and also Eastern Desert. Maadi is located circa 10 Km south of Cairo; this centre also gives the name to the most important among the local predynastic cultures (Maadi-Buto) which emerged before the "Naqadization" of the Memphite region and Delta. Maadi would seem to be linked with Fayum A and particularly with Merimde; wasn't it for the half a millennium of gap between Merimde and Maadi, there would be much to debate about a possible direct connection of these two cultures; indeed the general impression of the Maadians is that of a population retaining strong Neolithic resemblance, without the marked social stratification, the belligerent inclination and the tendency to the expansion characterizing the Naqadians; but with an outstanding propensity and dynamism in trade relations. In this survey I do not aim to describe in details the single characters all the relevant units of predynastic Egypt; but among the traits of interest at Maadi we must surely mention the presence of disk-shaped mace-heads, cosmetic palettes and stone vessels; copper is found in quantities previously never attested; there was instead scarce focus on grave goods and tombs in general (which unlike at Merimde were neatly separated from the village). The cited trade contacts that Maadi entertained with Palestine, Upper Egypt and perhaps even Libya are the principal feature of the Maadi culture. In change of exported cereals (stored in silos and transported by donkey caravans), the Maadians imported rough materials as Sinai copper, Levantine oil, fat, aromatic substances and also products like flint tools and lance blades. Some artefacts from the Upper Egypt make us suppose a major intermediation role of Maadi in the trade circuit between Levant and Upper Egypt; perhaps it is not a chance that Maadi's decline was contemporary with the outset of the Gerzean expansionism, and this latter may have in turn a strong reason to be in the Naqadians' will to have a direct access to the lucrative network of "international" trade which Maadi controlled and mediated. Its chronology is still rather uncertain, but it seems that Maadi was roughly contemporary with the Up.Eg. Amratian and Early Gerzean phases (3900/3800 -3500 BC); we have seen that the site was abandoned around Middle Naqada II; but the Western Delta center of Tell Fara'in-Buto retained the Lower Egyptian cultural imprint for almost two centuries more (up to Naqada IID2). Middle Egypt (from Matmar to Hemmamieh) was the cradle of the Badarian (4900?/4500-3900 BC), a close parent of the Naqada civilization. This culture, of which only scanty traces have been found out of the Middle Egyptian "Badari district", would deserve a separate treatment, particularly to evidence the many aspects it had in common with the early Naqada (whether objects typologies or ideological affinities), with Sudanese Khartoum Neolithic and with Sahara complexes. The Badarian also constitutes the first known attestation of Agriculture in the Egyptian Nile Valley. Distinctive traits are the Black topped and the rippled surface pottery, the long rectangular cosmetic palettes, clay and ivory female figurines; in the socio-economical sphere we must stress the marked social differentiation (rich grave-goods, body-ornaments, display) and the related presence of materials from long distance trade circuits (Red Sea shells, copper, lapis-lazuli). In the Badarian site of Hemmamieh a clear stratigraphic sequence showed the transition from late Badarian to early Naqada (I); there seems to have been a possible overlapping of Badarian and Amratian along the first or the first two centuries of the Fourth Millennium (END OF UPDATE). - Petrie's Gerzean was originally only from SD 39/40 to 52/53. - Petrie's 'Semainean' also comprehended late Naqada II. The term has known far less popularity than Amratian and Gerzean. - For comparison of Kaiser's and Hendrickx subdivisions of Naqada phases, see the figure at the bottom of this page. Early, Middle and Late Predynastic can have slightly different sense/meanings. * 'Protodynastic' could be a synonym of Early Dynastic as well (from the Greek root protos = 'first'). But since the very first part of the Dynastic Period may also be considered to have been the Late Predynastic/"Dynasty 0", these latter terms can match the meaning of "Protodynastic". ** Qa'a's reign is more correctly considered, in cultural terms, as early-Naqada IIID (Hendrickx's chronology). All the absolute dates from Late Predynastic onward are approximative of at least �50 years. this Dynasty could have started at c. 3090BC and eventually ended one or two decades before or later than 2860 BCE. The predynastic is the period in which Egyptians began to take the first steps towards the Unification of their country. Naqada I (Amratian) is a phase of transition between the Middle Egypt Badarian and the Upper Egypt Gerzean.Its characters are still those of egalitarian societies. But at the end of Naqada I phase the first tombs with high status indicators do appear at Abadiya (B 101, B102), Naqada (Main Predynastic Cemetery tombs 1587,, 1503, 1497, 1610- in which a vessel with a red crown decoration was found-), Abydos (Cem. U tombs U- 502, U-239) and Hierakonpolis (Loc. 6 cem. tombs 3 and 6). The following Naqada II (Gerzean) witnesses the increase of the social inequalities as attested by prestige artifacts as early as late Naqada I as the Gebelein painted textile (Naqada IIa) and especially by the middle Gerzean Hierakonpolis Tomb 100 with its beautiful painted scenes (Naqada IIc). This latter had to be the tomb of a chief and therefore there's evidence that a ruling elite had taken power in some places. The former document, one of the oldest painted lined preserved in the history of Mankind, is transitional in many aspects, and to be dated late in the Amratian (Naqada IIa). [For the proposal of a date of this painting to Naqada Ic, instead of Naqada IIa-b, cfr. E. Nowak, in Poznan 2003 Symposium, kindly summarised by J.J. Castillos on his website). Naqada II is also the period in which the decorated ware appears; ivory statuettes, already known in the Amratian, become finer and more numerous. But one of the most important characters of the Gerzean is the diffusion of artefacts and ideas to the north; this probably first happened for commercial contacts, then for needs of expansion and of trade routes control. However the way in which this northward migration of the Naqada II culture happened is still object of debate : we see that it happens by the changes in the style of the vessels shape and decorations, mudbrick architecture, elite cemeteries and so on; it remains doubtful whether warfare and real peoples' migrations were the means through which this was realised or whether it was only a slower and peaceful cultural superimposition (the former of the two hypotheses, which has always been credited as the more verisimilar one, has a main flaw in the lack of weapons and of warfare-artefacts in general in the elite tombs). Also a very important and debated question is the influence of the Mesopotamian civilization in the egyptian Naqada II and III. 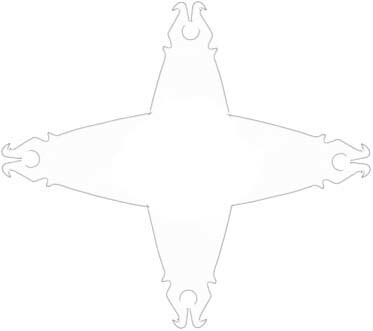 There are some similarities with sumerian motives that can only be explained hypothizing direct contacts and borrowings (artistic and religious motives like 'serpopards', palace facade device, hero between two standing bulls, bark designs and many others, mudbrick architecture, writing). The writing is another element that scholars have always considered an Egyptian borrowing from Sumerians (Jemet Nasr, Uruk IV) : but it doesn't mean that Egyptians copied the signs, they could also have only copied the principle of the writing; moreover recent discoveries from Abydos cemetery U have further increased the antiquity of the Egyptian earliest writings and thence we could advance that the possibility of an inverse borrowing (from Egypt to Sumer) or a separate invention (from similar needs) appears more and more likely. The cited fact that equal problems,circumstances or urges could have generated similar solutions mustn't be underestimated; for example the human sacrifice is attested in both the civilizations in object : but this behaviour is recognized as a recurrent one in the cultures at this stage of evolution, particularly in the early states, when violence and intimidation are the best ways for the ruler to gain respect and authority, showing their power through conspicuous consumption of valuables (very rich tombs and buildings, conquest wars and voluntary 'waste' of human lives). The most powerful centre of this period is certainly Naqada. Hierakonpolis and Abydos seem to undergo a hiatus perhaps for their ruling elites were less powerful then before or simply because their tombs haven't been found. Apart from some pits (U-133, U-149) at Abydos only the tomb U-q witnesses a certain degree of display : it's the first brick- lined tomb discovered so far there. Naqada II at Abydos cem U is less impressive in findings than late Naqada I and Naq. III; there has not been found a single brick lined tomb in cem.U of late Naqada II date, although the pit U-547 (Naqada IId2) had been provided with a red limestone heqa sceptre. At Naqada a new cemetery (T) guests the ruling elite tombs. T4 was a very important tomb (Naqada IIb date) around which many others were later dug. The wealthiest tombs of the following period are T5 and T29 -Naqada IIc-, whereas T9,T10,T16 and T17 date Naqada IId and T25 (containing more than 30 pots) date to Naqada IId2. Abadiya region was conquered at the beginning of Naqada II by Abydos or Naqada. As we have seen, late Naqada II saw the probable emergence of a short living local ruling elite at Gebelein. The Hierakonpolis T100 cemetery is an indicator of the good health and power of the local ruling family of that centre. This period, although probably still far from a real unification under one single ruler, is already recognizable as one of cultural uniformity through all the country as shown by the general uniformity of artefacts and uses which the regional cemeteries show. In the next period, Naqada IIIa ('Dynasty 00' ), the ruling elite of Thinis (whose chiefs are buried in the Abydos cemetery U) re-emerges as a power in the Upper Egypt (Naqada begins to decline) and the (beginning of) Naqada IIIa2 tomb U-j is the richest tomb of Egypt ever found until that period (c. 3200-3150 BC). At the the end of this phase and in the beginning of the subsequent one the earliest rulers' designations and names appear, in the form of anonymous serekhs (palace facade) incised or ink-inscribed at Abydos tombs U-j, U-k, U-s, U-i but also elsewhere as at Abusir el Meleq tombs 1021, 1144 and Rafiah. (Cfr. van den Brink in Spencer ed. 'Aspects of Early Egypt', 1996 pl.5 p. 151). In the following Naqada IIIb1 ('Dynasty 0') vessels are inscribed with serekhs with or without a falcon onto them. but these must have been local rulers who held power on restricted regional areas even if they all shared a common culture. As for the Lower Egypt rulers of Tarkhan (tomb 1702, Hat Hor ?, tombs 351, 1549 Crocodile) and Delta, it can be shown that Lower Nubia  was under the domain of at least two regional entities during the early Naqada III (A group): at Seyala (cemetery 137 tomb 1) and even more in the south at Qustul (cemet. L tomb 24 from where a famous decorated incense burner comes) two polities grew probably by the exploitation of the Upper Nubian trades; later, in Middle Naqada III, these regional centres were destroyed, very likely by the expanding Hierakonpolis power (HK loc.6 tomb 11, Naqada IId2/IIIa2) as the Gebel Sheikh Suleiman battle scenes graffiti do attest (fig. below: the scene was once erroneously attributed to the reign of Djer; W.Murnane J.N.E.S.46). also the will to control long-distance trade routes on which precious (elite) goods travelled (the long-distance trade was also a very important factor in the relations of Eastern Delta and southern Palestine during this and the following period). The Thinite rulers were probably those who inherited the territory of Naqada (which controlled the Wadi Hammamat) : they initially by-passed the Qena bend through the road of the Gebel Tjauty (Theban western desert) to access to the Nubian trade routes; in this phase there seems to have been a decisive victory of Thinis/Abydos over Naqada as attested by a rock drawing in the Luxor-Farshut desert road; this brought the southern Abydene boundary touch the Hieraconpolite northern one . The Hierakonpolis rulers remained the only rivals of the Thinite kings and this rivalry lasted until the time of the Unification. In the period Naqada IIIb2 ('End of Dynasty 0') the Abydos (Thinis) chiefs are buried in the cemetery B (B0/1/2 Iry Hor, B7/9 Ka) in which the later tombs are those of Narmer (B17/18) and Aha (B10/15/19/16) beginners of the First Dynasty. King Scorpion (II) is considered a predecessor of Narmer who could have belonged to the Hierakonpolis ruling family. The name Iry Hor is attested only at Abydos (Falcon over a mouth, with no Serekh-), Ka is instead known from Tell Ibrahim Awad, Helwan, Tarkhan and Abydos. This Abydene dynasty (Iry Hor, Ka, Narmer) is a real ruling family (initially the term 'Dynasty 0' was attributed to these kings of Abydos only, not also to other local rulers of Upper - Lower Egypt). and he was regarded as the founder of the First Dynasty (perhaps he did originate the legendary figure of Menes). He is associated with the beginning of the phase Naqada IIIc (Dynasty I). This king must have also be the one who solved the question of the Hierakonpolis rivalry : but the way in which he did this can only be speculated; there aren't traces of military victories of Abydos over Hierakonpolis, thence the question could have been peacefully brought to an end by recognizing the authorithy of Nekhen with king's concessions to the powerful local families. This aspect of the Egypt Unification, like many others, is still surrounded by shadow. "Dynasty 00" [see the related page] is a term used by some authors to indicate all the rulers of the period before Dynasty 0; but, alike this latter, there isn't any relation among many of the rulers within Dynasty 00, because they are local chiefs of different centres and they did not recognize themselves as being part of the same ruling family except at a local level. This 'dynasty' would thus begin with the ruler buried with the Gebelein cloth in Turin, the owner of HK tomb 100, those of some elite tombs in Naqada cem. T (Wilkinson, 1999 p. 52) and finally the Abydos later cem. U rulers, or those of the early serekhs from Hierakonpolis loc.6 tombs 1,10,11. Therefore Dynasty 00 indicates a period in the protodynastic, not a single line of rulers of a specific place; indeed the first use of the term "dynasty 00", by van den Brink (in id. ed 'The Nile Delta in Transition' 1992 p.vi n.1) was related to the 'members of the ruling class buried in cemetery U at Abydos Umm el Qaab' who were 'possibly the predecessors of the Dynasty 0 Kings'. By the same way, initially, "Dynasty 0" was applied only to the Abydos kings buried in cem. B (Iry Hor, Ka, Narmer). In the Eighties it has been much debated about the 'Nubian Origin' of the Egyptian Early Dynastic kingship; but this indeed was a misinterpretation of an article of B. Williams (Archaeology 33.5, 1980 p.14-21) by W.Y. Adams (J.N.E.S. 44, 1985): the same author (B. Williams in J.N.E.S. 46, 1987 p.14 ff) clarified that he only supposed a Nubian Unification in an earlier period than in Egypt (but at that time the D.A.I.K. discoveries in the Abydos cemetery U hadn't yet been done). See M.D.A.I.K. 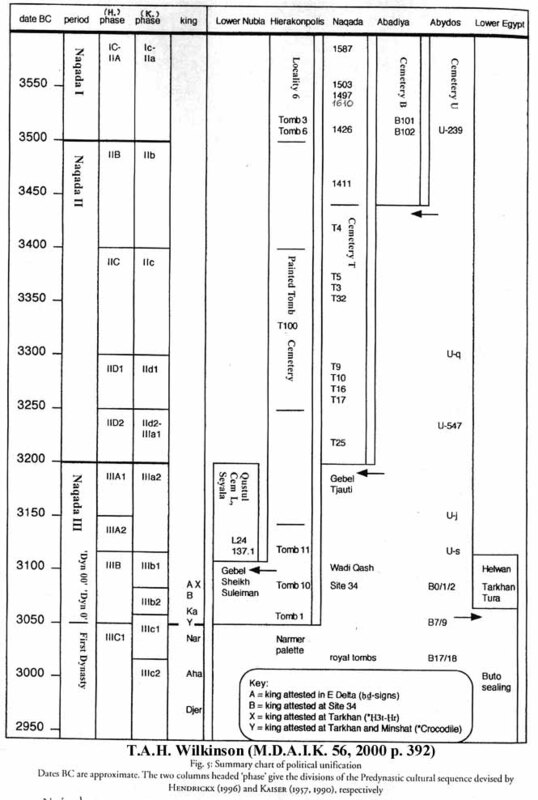 56, 2000 p.377-95 (T. Wilkinson) for a reconstruction of the history of the period Naqada Ic to IIIb2. B. Kemp has proposed in 1989 (Ancient Egypt- Anatomy of a civilization p.31-63) a model of state formation for early Egypt. From an initial scenario of leaderless aggregates practising settled agriculture in their own stretch of land, psychological factors as a deeper sense of territorial ownership caused by the continuous exploitation of the same territory, favoured the creation of the concept of property over all the things that the territory comprehended, including the people. Mystic,symbolic and mythical factors surely were expressions of this sense of right that generated the idea of 'sovereignty' in the mind of some individuals who began to aim to reach a superior welfare -agricultural products surplus- by forcing others to work for them. So the leaderless communities became "aggregations... in which a few were leaders, and the majority were led". This was not the end of a process but indeed the beginning of a kind of game. The arise of leading elites happened in fact in various regions and therefore we theorize a situation that the author compares with the game of 'Monopoly'. All the players begin to play from a similar point , but when, for combination of chances (environmental and local factors) and personal decisions, they come into contact and conflict with each other, the initial equality begins to tremble until the equilibrium falls : this in turn distorts "the whole subsequent progress of the game. It has a knock-on effect out of all proportion to its original importance... We can imagine thousands of games proceeding simultaneously, with winners promoted to join a progression of increasingly select games " (note that each player involves a time-scale of many generations). The 'victory' of a small agricultural village over its neighbours takes it on a path towards an higher level of prosperity and power, because the winner can take the wealth of the defeated through taxes; furthermore a 'multiplier effect' caused by the interaction of different factors (religion, symbols of power, technology, population, war, elites' building and tombs, trade routes control and others) increases the size of the village and that of the territory it controls.
" Two factors determine how far and how fast along this path particular communities journey... The natural resource base, the potential for accumulating pockets of surplus commodities which form the basis of power ... and the creative power of imagination to fashion a distinctive ideology which through a wealth of symbol and ritual commands widespread respect ". Now there are tens of local entities each of which rules some minor centres of its periphery. These local entities, for the same reasons which caused their earlier expansion, will promote pacifical or bellicose activity against the nearby ruling centres: winners of this stage of the game will be regional states like those centered at Hierakonpolis (Nekhen), Naqada (Nwbt) and Abydos (Tnt, Abdw) during Naqada II-IIIab. Each of these three regional proto-kingdoms had a fundamental importance for the formation of an Egyptian super-regional and unified state; the best documented is perhaps Hierakonpolis, for which the data come from various kinds of contexts, whereas at Abydos and Naqada the evidence is almost completely based on cemeteries' excavations and analysis. Only very recently it has been possible to begin a crossed research to try to determine the interaction of these three kingdoms. 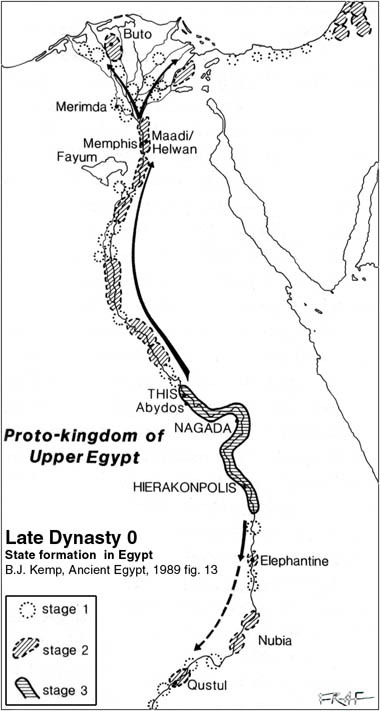 But, if we can fairly assume that Naqada was going to decline when Abydos began to arise and Hierakonpolis still flourished, the relation between the latter two remains an enigma: we can't be sure if they were, at the end of Naqada II period, 2 separate and independent kingdoms or if instead it was the ruling elite of Hieraconpolis that did migrate to Abydos (cemetery U chiefs). Apart from these historical matters we must point out that the unification of Egypt, commonly attributed to Narmer, was a process that had already begun many generations before him. And the ideology of the early dynastic kingship owes a lot to the local tradition of the mentioned late predynastic centres. We have already seen that Kemp gave great importance to the natural resources as well as to the ideology, in the process of formation of larger and larger kingdoms. Kemp discusses 3 'foundations of ideology': the local tradition, the containment of unrule and architecture as political statement. 'Local tradition' is all the complex of beliefs and symbols displayed by the elites to reinforce their right to rule. Many of these (some myths, traditions, religious beliefs, symbols of power) became part of the dynastic culture, while others disappeared. 'Containment of the unrule' is the concept which creates the 'need for kingship': the mythical golden age where and when 'maat' ruled is continuously menaced by the forces of chaos. The divine king is the only power that can make maat prevail over chaos. The 'Architecture as political statement' is another complex concept: a number of symbolic (religious, political,social) and also psychological factors are linked with (monumental) architecture; the meaning of 'palace facade' enclosure walls and of buildings within them (mounds) and other monuments lies in the sphere of the religious beliefs (think about the Djoser's complex symbols), but it also has an heavy impact on the minds of the ruled masses, astonished by the elites' display of richness. Such a 'conspicuous consumption' of wealth for building larger and larger tombs reinforces the right to reign and augments the authority of the leaders over the submitted classes which marvel at the creations of their rulers (made by their own hands). *** *** ***Note (of F.R. ): the indication of 'Dyn 00' in this table should be moved further up, beside Naqada IIIa2. From Naqada IIIb2 backwards the time-line is, in my opinion, 50-100 years too low (i.e. Naqada III should start c. 3300BC; Naqada II, 3600BC)..
On the journal the article also includes different images, tables, the second part and is translated into French.